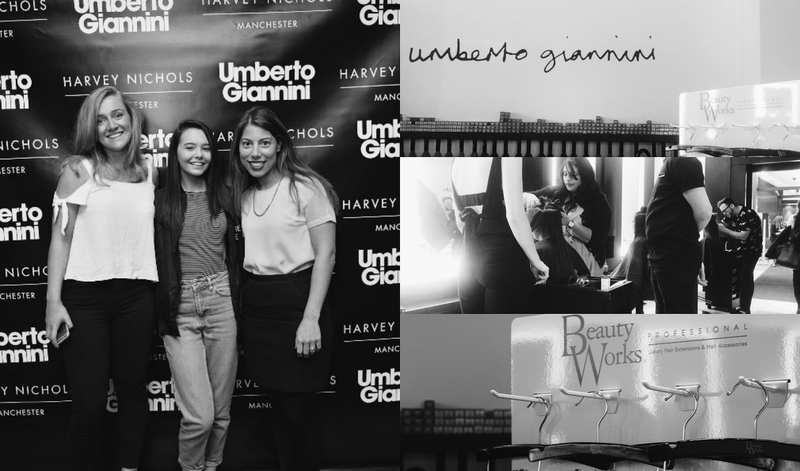 You might have seen my last two blog posts (here if not) about the beautiful, award winning hairdressers Umberto Giannini inside Harvey Nichols Manchester. They have recently launched the Beauty Works x Jen Atkins Collection at their Salon and I was invited to the launch party. Demonstrations were shown throughout the night and now I am feeling pretty clued up about the hair pieces! I remember being in Year 9 and getting my first set of hair extensions, everyone in school had the clip-in hair pieces and I asked my Mum everyday to buy them (she really didnt want too) but she finally gave in and bought me a pack. Turns out I had no idea how to clip them in and make them look nice so I just threw them away, oops! But after seeing the demonstrations of the different hair extension techniques out today, I am shocked at how amazingly natural they look! Jen Atkins is a celebrity hair stylist (for the Kardashians - major!) and has created the ultimate hair extensions with Beauty Works which can be found at Umberto Giannini! Throughout the night I got to see the different methods which were the nano bond, tape and weft. I personally really liked how the nano bond was so tiny that they were pretty much invisible! I really love the un-natural, natural look. If that makes sense? The tape method also looked really easy to use, there is literally tape that sticks to hair and then you can't see it! It looked far more easier than the old clip in extensions! If you're interested in getting extensions then I would definitely recommend going to a hair salon like Umberto to get the best quality treatment, they extensions come in all hair colours and feel and look amazing!